One of the first stops that most tourists make on their visit to Prague is to see the Astronomical Clock or Prague Orloj in the Old Town Square. 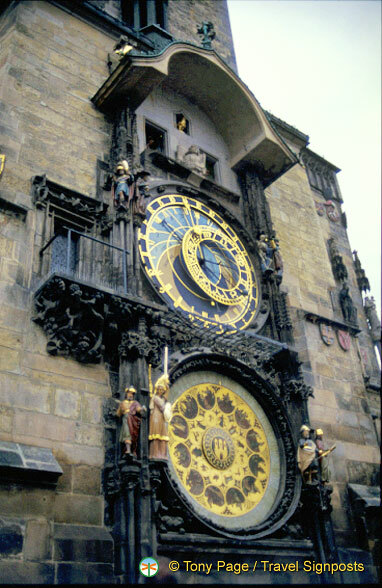 This grand old Prague clock was installed in 1410, making it the third-oldest astronomical clock in the world. According to a local legend, ill fate will befall the city if the clock is neglected. Is it any wonder that after 600 years, the Astronomical Clock still ticks on! The Prague Astronomical Clock has an hourly performance, like the popular Glockenspeils in Germany. In the upper part of the astronomical clock, the 12 apostles appear every hour between 9 a.m. and 9 p.m. doing The Walk of the Apostles. The four figures that flank the clock are also set in motion at the hour. These figures represent Vanity, Greed, Death and Pleasure, the four things that were despised during the period when the clock was made. Take a look at the figure on the left and you’ll see Vanity admiring himself in the mirror. Next to him is the stereotype figure of a Jew holding a bag of gold representing Greed. Moving to the right the skeletal figure of Death strikes the time on the hour. Next to Death is the Turk which represents pleasure and entertainment. Whilst visitors might find this little show entertaining, the Astronomical Clock itself has very complex mechanism and functions. The upper face has the Astronomical dial which includes four main moving parts: the Zodiac ring, an outer rotating ring, a Sun icon as well as a Moon icon which tells all kinds of times and positions of planets. For instance, the outer edge of the clock with the golden Schwabacher numerals indicate the Old Czech Time. The next set of golden Roman numbers next to the Schwabacher numerals are the timescale of a normal 24 hour day and indicate time in local Prague time. Then there’s the zodiac ring whic indicates the location of the Sun on the ecliptic, etc. The lower face of the Astronomical Clock has a Calendar which was added in 1870. There is an ancient belief that the Old Town Square and Astronomical Clock are sites with magical powers, and the magic of the Astronomical Clock continues to cast a spell on the millions of tourists who come to see this clock each year. The post The Astronomical Clock – Keeping Time In Praque for 600 Years appeared first on Czech Republic Travel.